Velvet Paw Creations: "Miss Purple Poison" - A Blockheads Design Team Card! 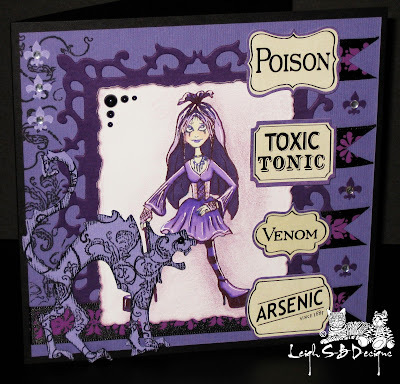 "Miss Purple Poison" - A Blockheads Design Team Card! There's a new permanent marker in town worthy of being a rival for Copics and guess what, they're more affordable and just as awesome and they're now available at Blockheads Paper Arts! Let me introduce you to the new Marvy Le Plume Permanent markers! 141 colours are available including a Blender Pen and Stacey and I have been very busy putting together some perfect blending sets to get you started as well as a 46 marker set consisting of what we consider the most versatile colours to have in your collection! They are permanent, alcohol based markers with soft bullet shaped brush nibs and I've been having a blast experimenting with them. 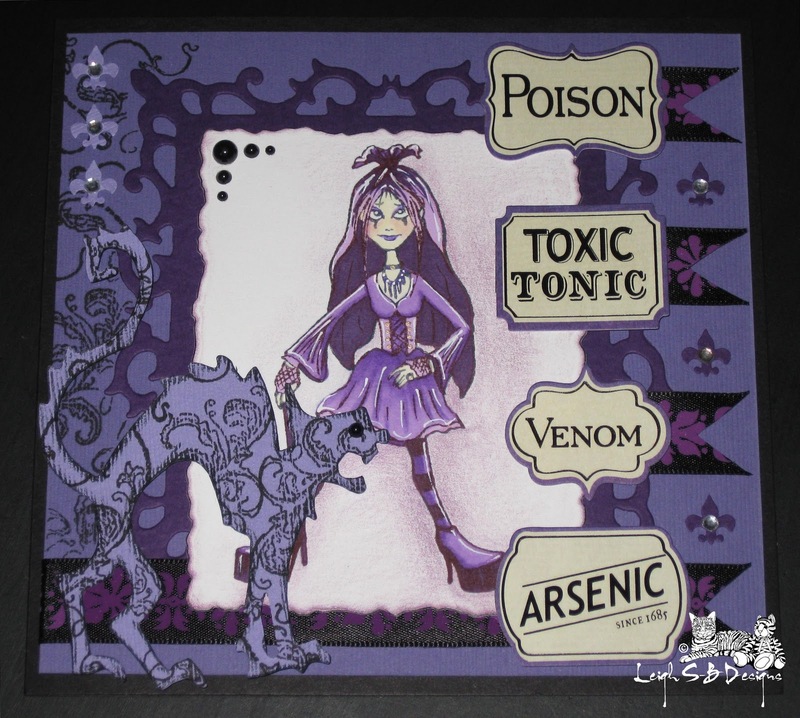 Today I'm sharing a Halloween themed card I made using the new Le Plume Permanents and I will be sharing a step-by-step blending tutorial demonstrating how I went about colouring the image featured on my card as well as a product review over on the Blockheads Blog! So keep an eye out for my announcements for those! Stamp the image onto a sheet of Neenah Solar White cardstock and colour with Marvy Le Plume Permanent markers. I used 4 blending colours from the Blue Violet range. I will be sharing a Blending Tutorial soon demonstrating exactly how I went about colouring in this image so keep a look out for it! I used Prismacolor pencils to colour the Goth Girl's skin and facial features. I went with the Cream coloured pencil instead of leaving her skin white coz I wanted to pick up on the cream backgrounds on the Toxic Labels. I added a touch of background colour by creating a sense of a shadow being cast with a Prismacolor Red Violet coloured pencil. I also used the same colour to distress the deckle edge and then darkened the distressing with a Prismacolor Black coloured pencil. I completed the image with some white highlights. I used the opaque White Marvy Le Plume marker on her eyes which is part of the new range but it's a pigment pen instead of permanent and is water-based and the Gel pen for the rest. There's also a Gold and Silver water-based marker in the collection too. I used a Deckle Spellbinders die to cut out the panel and layered it onto a dark purple Fleur De Lis die cut. From a lighter shade of purple cardstock I cut a square panel and then I made a black folded card just slightly larger. Before assembling all the elements together I cut a length of decorative silk ribbon, trimmed the right hand edge into a dove tail point and slipped it between the white panel and the Fleur De Lis panel and adhered it in place with permanent adhesive tape. I then adhered all the mats together with double-sided tape. The purple edged Toxic Labels came attached on a border strip and couldn't have been more perfect for my project. I cut off 4 of the labels and I then cut 3 small pieces of ribbon, trimmed with matching dove tails and adhered them to the Toxic Labels with permanent adhesive tape and then adhered all the labels to the card with glue dots. 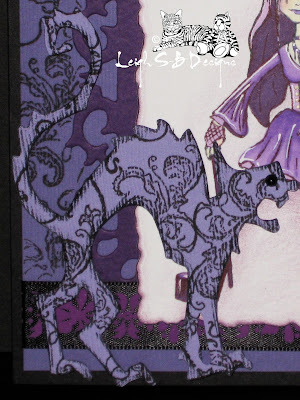 From the lightest purple cardstock I die cut the Scardy Cat and decorated it with stamped Memento Tuxedo Black flourishes which is actually a portion of the flourishes from the right hand side of the Bird Cage image! I then darkened the edges of the Scardy Cat die cut with a Prismacolor Black pencil to make it stand out a bit better from the background. 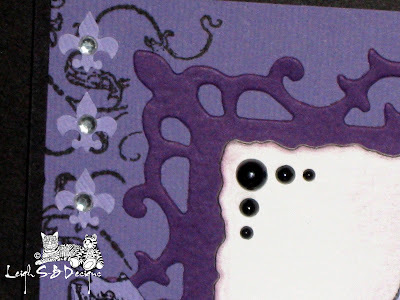 I then punched out 3 mini Fleur De Lis from the lightest purple cardstock and 3 from the darkest purple cardstock and adhered clear rhinestones to them with a Quickie Glue Pen. When I laid them out onto my card I realized I wasn't happy with the balance of the design and felt that the left side seemed empty to me so I did some magic masking aka post-it notes ;0) and masked off the Fleur De Lis panel and stamped more of the flourishes down the left hand side of the square purple panel. I used my Copic Multi-liner (any black extra-fine point pen will work too) to fill in some areas that didn't stamp and I was happy with the result. I then adhered all the mini Fleur De Lis with the Quickie Glue pen. I embellished the white panel with self-adhesive black pearls and gave the Scardy Cat die cut a black pearl eye. I finished off by adhering the Scardy Cat to my card with small glue dots for a bit of dimension. 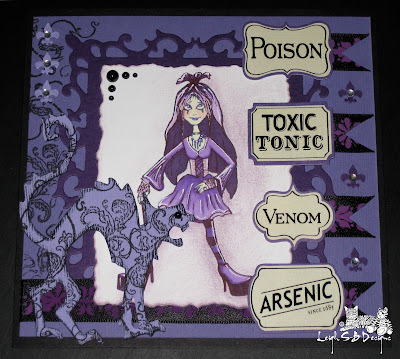 Thanks for visiting with me today and don't forget to keep an eye out for the Blending Tutorial if you'd like to see how I coloured my little Miss Purple Poison witch! Don't forget to also check out Karen's blog for more Blockheads inspiration!